ROBERT Wright, now senior editor at The New Republic, appropriately begins his "search for meaning" by taking us on a journey: to the private Caribbean island of multimillionaire computer scientist Edward Fredkin (rumored to be the model for the pessimistic and reclusive computer guru in the movie, War Games). 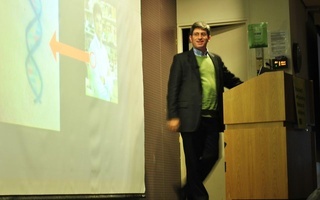 Fredkin has stirred a debate in physics by proposing that the universe is fundamentally made up not of matter and energy, as commonly supposed, but of information, assembled into different forms by what he calls "programming rules." Basically, Ed Fredkin thinks the universe is a computer. He has evidence, and no one, so far, has been able to prove him wrong. His is only the first of the provocative ideas that fill the pages of Three Scientists and Their Gods, a book that intertwines the biographies of three men with an exploration of the modern concept of "information". The book's unifying idea, "information" is deeply ambiguous, which is one of its attractions for rigorous thinkers who like to venture into uncharted but fertile territory. Science has become fascinated in recent years with the origin and maintenance of order, whether physical, biological or social. Information is regularly used as the measure of this order, as it constantly struggles against the randomness, or entropy, threatening to tear it apart. THESE three scientists were clearly chosen to give as wide a perspective as possible on the topic. Fredkin and his theory of "digital physics" provide the basis for an investigation of information in the physical sciences. The life and work of Harvard's own E.O. Wilson, expert in insect communication and sometime "father of sociobiology," leads Wright to investigate biology. Finally, attention shifts to the role of information in the social sciences and the work of economist and systems-theorist Kenneth Boulding. Wright's three scientists are not "representative" of accepted opinion, but creative thinkers willing to break new ground. All three, while attaining academic respectability, even distinction, have seen many of their ideas dismissed by the majority of their colleagues as, at best, incautious, at worst, dangerously erroneous quackery. Few physicists, for example, are willing to even entertain the computer-as-universe model, and Boulding's theories of "ecodynamics" and our future cultural evolution have been written off as too vague and unfocused to be of much use. 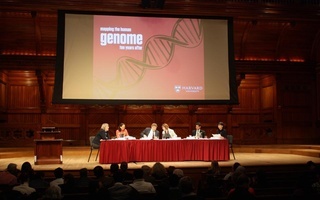 In Wilson's case, the debate over the power of genes, culture and sociobiology still smolders, especially here at Harvard; a decade ago it raged, and bitter (often unfair) words appeared against him. But precisely this boldness and individualism which offends others draws Wright to these thinkers. The clarity and friendliness of the author's prose allows us to enjoy a triptych of scientists at work. We watch each of them grow with their ideas, which both guide them and are in turn reshaped by their contributions. WRIGHT'S journey through the role of information in cosmology, sociobiology and systems theory teaches us also about the joys and pains of being a scientist, particularly one with his own personal ideas about how the world works. Sometimes, all three seem to share the frustration of Ed Fredkin, who tells the author, "I feel like I'm the only person with eyes in a world that's blind." All three have spent many years searching for unifying principles in the patterns of information that surround us. For Fredkin, the lifelong rationalist, the universe itself is the vast expression of many iterations of simple but powerful ordering rules. Wilson, filled since childhood with a love for the natural world, has investigated how communication permits the evolution of complex animal societies, bound together by the exchange of information. Boulding's deep religious convictions and pacifism have led him to find a way for nations to someday interact without violence, based on networks of shared values and mutual interests. As the book continues, its two strands, scientific exposition and scientific biography, come together as we begin to glimpse the deep rationale behind it. Wright's purpose is not merely to understand the nature of meaningful information; it is to explore the meaning of life and what modern science has to say on the value of human existence. His method shows that abstract theories of information are ultimately still the products of individual thinkers. The scientific world view gives our lives no objective value or intrinsic purpose. We cannot blindly follow our biological imperatives, for if we did, something of our humanity would be lost. We are evolution's orphans. Our intellectual integrity does not allow us to abandon science, yet Wright wishes that somehow it gave more metaphysical comfort. If anyone can reconcile science and a universe with meaning, he seems to have reasoned, it will be these scientists. From different disciplines, brilliant and somewhat iconoclastic, the work of all three has focused on meaning and the nature of information. At the heart of the book are their insights, and the tale of how Fredkin, Wilson and Boulding arrived at them, through their scientific work and lives well lived. PLAINLY, Wright wants concrete answers to the great doubts that most of us sometimes confront, but he is under no illusion that these scientists provide them. They are making guesses, as we are. Theirs are perhaps more educated, but in the end, their actions seem more eloquent than their words. They have lived their lives with a passion for knowledge, the same passion that motivated Wright to give us this book, and to write it so well. The best journalists, like the best scientists, turn their lives into acts of discovery. If Three Scientists and Their Gods gives us a hint into the meaning of human life, it is less in the facts it presents, than the investigative process the book both describes and represents. The search itself has given meaning to the lives of the three scientists and indeed, to the life of their biographer: amid their many differences in interests, ideal and temperament, this god of discovery and restless seeking informs all their lives. A multi-national group of scientists, including Harvard Professor of Astronomy Robert P. Kirshner, made a startling discovery this past year. Valerie H. Weiss began a Ph.D. program at Harvard Medical School—and ended up as a film writer and a director. Individuals with mutations in specific genes have a high risk of autism, according to scientists working independently at Harvard, Yale, and the University of Washington in Seattle.